Ultimate Guide To Dog-Friendly Places: Hang Out With Your Doggy All Day, Every Day! Why not bring your pooch along to your next gathering? We have compiled a fun list of dog-friendly places: cafes, beaches and even a hotel, that allows you to spend some time with your fur-kid! No more sad, droopy eyes staring back at you. Plus, they also get to socialise and make some new friends. That’s definitely a win-win for doggy and us! Admit it, all of us dog owners secretly wish all cafes are dog-friendly. We’re glad to announce that this secret dream of ours is actually coming true. There are quite a few dog-friendly cafes with excellent food in Singapore. Not all of them have separate menus for our furry friends though, but we are sure that they are contented just lying around and spending time with us! A superb area located in Changi, The Coastal Settlement has both indoor and outdoor seating areas. It is a cosy and spacious cafe with pretty awesome food for the humans. Also, water bowls are complimentary for our little ones. This will be great for some quality, cosy time with both your human friends and furry loved ones. Order some finger food to share and enjoy the well-deserved weekend! Casa Verde, which translates to “Green House” in English is a casual Italian restaurant located within the lush greenery of the Botanic Gardens. Think wood-fired pizzas and our favourite pastas. Casa Verde is a splendid place with great, authentic Italian food. Awesome, yummy food and you get to spend time with your little one – what’s more to ask for? Bring your fur-kid to Happenstance Cafe for a little treat! This warm, spacious and friendly cafe was opened with the intention of making both humans and furry ones feel at home. There is a separate menu for the doggy too. Aside from the usual food, pet accessories and apparels are available as well, if you are intending to give your little one an even bigger treat. Located at Siloso Beach Walk, Coastes is a beach-side bar with plenty of shady spots, sun beds and benches. Both of you get to enjoy a rustic, chilled-out day right along the beach. Enjoy simple Western fares like the usual Eggs Benedict and barbecued ribs. Fancy some ice cold beer while soaking up the sun? You can do that too! The al fresco dining area at Brussels Sprouts offers a great view of the Singapore River. Bring along your pooch and enjoy the gorgeous marina view together – isn’t that just pure bliss? This is also a great place to hang out with your friends over a bowl of mussels and a few Belgian beers. Your fur kid gets to tag along as well. Perfect! If you are looking to spend a quiet day with your furry lover, look no more. Sun Ray Cafe is the place! Located in Brighton Crescent in Serangoon Gardens, the cafe is definitely the right place to go to if you are looking for a mini escapade away from your usual busy lifestyle. The cafe is divided into two areas – one for the humans and the other one for the humans with the fur kids. If you are there for a weekend brunch, be sure to get the Big Brekkie for yourself. For the pets, they have a pretty great selection that includes Cream Cheese Salmon Rolls and Beef Shepherd’s Pies. With those yummy treats, your furry one is definitely going to jump around with joy after that hearty meal. Bonus: They serve really decent and affordable coffee! Pasta J’s famous for their excellent food quality – they make most of their own sauces and soup. If you want some tasty pasta, put Pasta J on the top of your list. The whole restaurant is dog approved and dog friendly – both their indoor and outdoor alfresco dining areas! Head on down if you are craving comfort western food and a comfortable friendly place to dine with your doggy. All doggies get a bowl of ice water when they arrive too! Get your pizza fix at Pepperoni Pizzeria! We were won over by their authentic wood-fired thin-crust pizzas and hearty portions of classic Italian dishes. What’s more, a few of their outlets are also pet-friendly! Your fur-kid will be so stoked by the aroma of the pizza. They can’t have any, but a little bit of crust once in a while wouldn’t hurt, right? This hidden gem is located within the residential area of Telok Kurau. The casual environment at The Garden Slug is perfect for a lazy weekend with your furry friend. They will thank you as well, since it is located next to a few pet stores and you could get some doggy treats or toys! Since they are famous for their huge platters that are great for sharing, grab your buddies and head down together! We are guilty of not letting our furry friend run around enough because our homes are just too small – no giant backyards or big gardens. Our doggies are surely bored of the usual walks around the neighbourhood. There are a few fenced up areas in Singapore called dog runs. These facilities are created just for our cute little ones. Remove those leashes and set them free, so they can enjoy the freedom of being in the great outdoors at least for awhile. We reckon they’d be so happy (and tired!) afterwards. An area that spans over 3km – we get why this place is a hot favourite on the weekends! There is also a fenced area designated for the bigger doggies out there. A place for the Westies! The park is open at all times so you can head there for a workout with your dog any time of the day. On top of providing biodegradable poo bags, water taps are also available, just in case our little ones get thirsty. Though the dog run is not that big, we are sure it is sufficient for a mid-week workout and training for our furry kids. Though the dog run is small, you can go for a walk with your doggy together in the spacious dog-friendly park. This animal resort is more than just big. It’s massively huge – spanning across two hectares! Besides a dog run, there are also other facilities such as a pet hotel, grooming school as well as agility facilities. Time to train our fur kids! All dogs are required to be leashed up (except for Marina Barrage) at these places, but we are certain that doggy won’t be blaming you for that leash, since they will be spending some quality time with their favourite person! 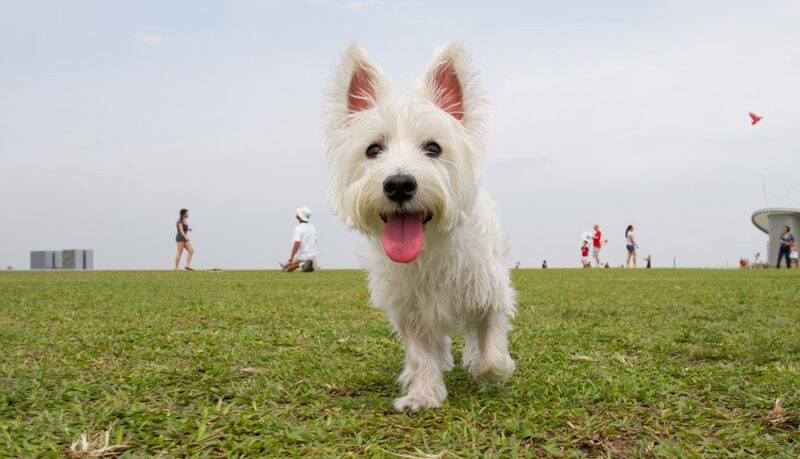 One of the most popular parks in Singapore, East Coast Park, is huge so there are plenty of spaces for your pooch to run around. A picnic with both your dog and human friends sounds really great! A walk with your furry companion in the scenic, award-winning Botanic Gardens is just pure enjoyment. Definitely a photo-worthy location for the both of you! Want a good, long walk with your pooch and explore a little bit of Singapore’s history at the same time? Try The Green Corridor! With a photogenic old railway line connecting to a few other green spaces like the Bukit Timah Nature Reserve – things are certainly going to get interesting. Marina Barrage is our ultimate favourite kite-flying site in Singapore and of course, our little ones are tagging along! Spend a peaceful family day at the open space flying your kites and having a picnic with that amazing paranomic view of Singapore’s cityscape. We are really glad to see so many great dog-friendly places that warmly welcome our pets. After all, we love them (a lot!!!!) and always want to give them the best. Just hanging out together and giving them a small little treat once in a while is certainly worth it. So, give these dog-friendly places a visit and we are pretty sure that your furry kid is so going to jump around with joy. Also, read The Ultimate Guide To Work-Friendly Cafes With WiFi In Singapore For 2016!